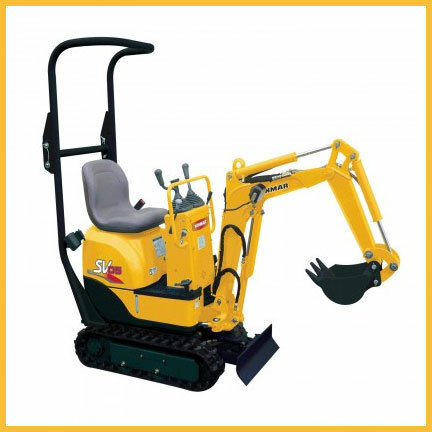 Yanmar, the only manufacturer to offer a micro-excavator in this weight class. Rear swing radius reduced to 735 mm. Reduced rear overhang (240 mm) to work closer to a wall. Dimensions of a micro-excavator of 300 kg, with the performance of a 600-kg machine. Digging forces: 390 kgf (arm) and 690 kgf (bucket). Possibility to go through the narrowest openings (700 mm). Machine easy to use, even for non-experimented users. Weight and dimensions allowing easy transport on a short trailer or in an utility vehicle. Hook on the boom to lift the machine from one point only.